Garret Jon Groenveld’s The Empty Nesters, a 2013 PlayGround Festival selection, has been selected for the TRU Festival this June in New York, a different sort of festival with the goal of finding a production team to produce either NFP or commercially in and around New York. Previously, MISSIVES appeared in the TRU Festival in 2006 and lead to a 2008 production of that first PlayGround commission. Tony Award winner Martin Pratt will be directing the June 16 reading. THE EMPTY NESTERS will receive its world premiere at the 6th Street Playhouse next year. 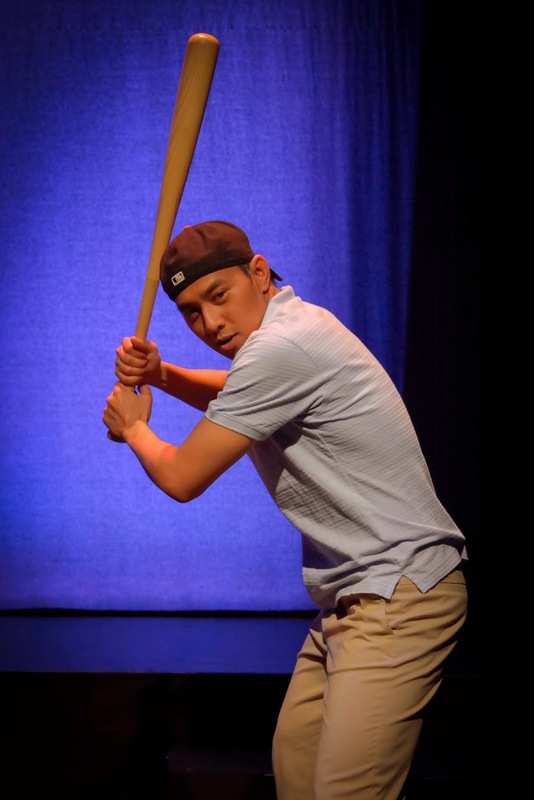 Ignacio Zulueta's PlayGround-commissioned Kano & Abe (a daly city bible story) is a semi-finalist for the 2014 Bay Area Playwrights Festival, and is in the running for the BAPF Finalist lineup to be announced shortly. Lauren Yee will workshop new plays this month at Chicago's American Theatre Company (atcweb.org) and the Playwrights' Center (pwcenter.org) in Minneapolis. SanFranLand just won 4 awards at LA WebFest, including Best New Comedy, and Best Ensemble Cast, which include Liz Anderson and PlayGround regular Patrick Russell. Amy Kirk Duvoisin moved to New Orleans in 2004. In 2008, she founded The Joan of Arc Project, a non-profit whose primary purpose is to create a street parade on Twelfth Night, also Joan of Arc’s birthday. The parade walks the streets of the French Quarter each year with characters in medieval costume, horses, large-scale puppets, and hands out handmade items. www.joanofarcparade.com. Michael Asberry is understudying in FENCES at Marin Theatre Company. Zoe Young's play Here We are in Heaven appeared in this month's Shotz showcase of five-minute plays at the Tides Theater. Inbal Kashtan’s full length play, Interference, will have a developmental reading through the Playwrights Center of San Francisco on April 21. Her short musical dramedy, WMPS* and Warriors (WMPS* = Well Meaning People), is a semi-finalist for the 2014 Female Playwrights ONSTAGE Project: Planting the Seed, Festival of New Work, and was read in Santa Barbara on April 12. Louis Parnell has done three readings in the "salon series" of 3GirlsTheatre, was recently nominated for a BATCC award for THE COUCH and starts rehearsals for INTO THE WOODS at San Francisco Playhouse in May. Mercedes Segesvary's play It's Just Lunch, directed by Ivan Rivas, will be performed at The Other Space Theatre, Hollywood April 17 at 8pm (www.importedtalent.com) and her play Man Legs Runs Free will be performed at the Metropolitan Playhouse, NYC through May 4 (www.metropolitanplayhouse.org). Molly Noble directed Five Women Wearing The Same Dress for College of Marin and will be appearing in Our Town, directed by Susannah Martin, at Shotgun Players in the fall. PlayGround Festival of New Works Lineup Announced! PlayGround has announced the lineup for the 18th annual PlayGround Festival of New Works – the Bay Area’s largest celebration of new works for the stage and screen by local writers. Running May 1-25 at San Francisco’s Thick House (and other Bay Area locations), the festival features the world premiere of Sleeping Cutie: A Fractured Fairy Tale Musical (which begins previews April 17), Festival Staged Readings of four new full-length plays, Best of PlayGround 18 celebrating the top short works of the season, and the third annual PlayGround Film Festival with screenings of 11 short films and writer interviews at the Roxie and Aquarius Theatres. The Festival includes more than 30 performances, screenings and readings over four weeks, featuring more than 150 Bay Area writers, directors, actors, filmmakers and designers. All-Festival Passes begin at $60 and individual tickets are $15-$55. Tickets are available through the Box Office at 415-992-6677 or online at www.PlayGround-sf.org/festival. At five-foot-seven, one-hundred-sixty pounds, light-hitting shortstop turned drive-time sports radio host Edward “Chip” Fuller is hardly the poster-boy for baseball’s steroid era. But when he learns his name will appear on a list of players linked to performance enhancing drugs, Chip is forced to explain his choice to colleagues, his listeners, and his family. In doing so, he must choose between a bland public apology and a much more difficult confession: that if he had it to do over again, he wouldn't change a thing. Ruben Grijalva (Value Over Replacement) earned his BA in Cinema from SFSU and helped start the fitness-entertainment company Virtual Active. Works include the award-winning short film Shadow Ball (2007), the full-length play Foresight (2010), and the short play Value Over Replacement, which featured in the Best of Playground 2013. Dust to Dust is the story of a young woman's fight against a family history of compulsive hoarding--or her battle against a Satanic attack on her grandmother's house, or both. Daniel Heath's (Dust to Dust) productions of full-length plays include Seven Days (SF Playhouse, San Francisco, 2010), Man of Rock (New York Musical Theatre Festival 2011, and the Climate Theatre, San Francisco, 2010) and A Merry Forking Christmas (PianoFight, San Francisco, 2009, 2010, 2011, and 2012). He is a PlayGround Resident Playwright and two-time recipient of PlayGround commissions, and his short plays have been performed across the U.S. and Canada. He wrote Dust to Dust as part of Just Theater's New Play Lab in 2012. By day he is a founding partner in Giant Rabbit, LLC, a company that builds web sites and data systems for non-profit organizations. In a city divided, who is responsible for building community? What boundaries do we need for protection? What boundaries do we need to cross? A pair of teenage lifeguards struggle to unwrap the mysteries of life during in a hot, slow summer amongst bratty kids, killer ping pong and lots of whistle-twirling. PlayGround, the Bay Area’s leading playwright incubator, provides unique development opportunities for the Bay Area’s best new playwrights, including the monthly Monday Night PlayGround staged reading series, annual Best of PlayGround Festival, full-length play commissions and support for the production of new plays by local playwrights through the New Play Production Fund and, PlayGround’s newest initiative, the PlayGround Film Festival. To date, PlayGround has supported nearly 200 local playwrights in the development and staging of over 680 original short plays and 50 new full-length plays, including more than a dozen that have since premiered in the Bay Area. PlayGround alumni have gone on to win local, national and international honors for their short and full-length work, including recognition at the Humana Festival, Sundance Festival, Source Festival, Bay Area Playwrights Festival, Aurora Theatre's Global Age Project, Internationalists Playwriting Prize, and New York International Fringe Festival, among others. More information at http://PlayGround-sf.org. Tickets: Best of PlayGround: $25-$40 (general), discounts available for students, PlayGround subscribers and members, and groups of 10 or more. Thursdays, May 8, 15, and 22 are Pay-What-You-Can performances; Pay-What-You-Can tickets go on sale one hour before the performance, first-come first-served, subject to availability. Tickets: Festival Staged Readings: $15 suggested donation, online at www.PlayGround-sf.org/festival/readings.shtml or at the door. All readings included in All-Festival Pass. All-Festival Passes: An All-Festival Pass includes one guaranteed priority-seating ticket to each festival event, including the PlayGround Film Festival, Best of PlayGround, four Festival Full-Length Staged Readings, and other festival ticketed events as announced (Sleeping Cutie must be purchased separately). Individual performance tickets must be reserved in advance and are subject to availability. $60 for 2014-15 PlayGround subscribers; $75 for non-subscribers ($150 value). To purchase an All-Festival Pass, call (415) 992-6677 or go online at http://www.PlayGround-sf.org/festival. 3rd PlayGround Film Fest - May 1 & 5 Only! The lineup and schedule has been announced for the Third Annual PlayGround Film Festival, a leading showcase for the Bay Area’s best new filmmakers and writers and their short work. It’s the unique brainchild of PlayGround and Dances with Light, representing an incredible fusion of the local theatre and film communities. Ranging from comedy to animation to powerful contemporary issues, the films are all adapted from some of the best short plays developed and produced by PlayGround over the last seventeen years and featured in the annual Best of PlayGround Festival. This year’s Film Festival features the short films originally premiered in 2012 and 2013, many of which have gone on to national/international acclaim including People’s Choice Award winners The Beginning and Miss Finknagle Succumbs to Chaos, in two back-to-back programs. The festival opens Thursday, May 1 at San Francisco’s Roxie and continues Monday, May 5 at Palo Alto’s Aquarius Theatre. 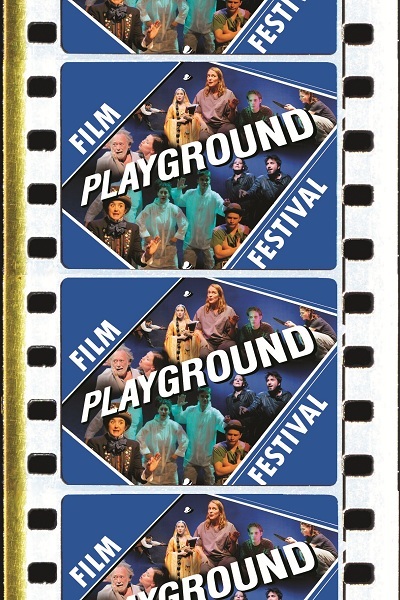 For tickets and more information please call 415-992-6677 or visit http://playground-sf.org/filmfest. Wednesday by Daniel Heath & Jennifer Arzt; The Etymology of Zero by Katie May, Liz Anderson and Seth Podowitz; Reunion by Kenn Rabin & The Runnel Brothers; The Beginning by Tom Swift & Brian Tolle; Ecce Homo by Jonathan Luskin, Mark Leialoha & Flying Moose Pictures. Aegis by Jonathan Luskin, Mark Leialoha & Flying Moose Pictures; The Secret Life of a Hotel Room by Garret Jon Groenveld & The Runnels Brothers; Climax by Sean Owens & Jeremy Solterbeck; Miss Finknagle Succumbs to Chaos by Kirk Shimano & Amy Harrison; Obit by Geetha Reddy & Brian Tolle; Undone by Diane Sampson & Bruce Coughran. BEST OF PLAYGROUND 18 Lineup! PlayGround caps off its 2013-14 season with Best of PlayGround 18, featuring five fully-produced ten-minute plays and a musical selected from the 36 works developed as part of the season’s Monday Night PlayGround staged reading series at Berkeley Repertory Theatre. Monday Night PlayGround has engaged and inspired a growing and enthusiastic audience with new plays and musicals inspired by a single topic each month, including “The Skin of Our Teeth”, “California Dreamin”, and, as part of a unique annual collaboration with Berkeley’s Mathematical Sciences Research Institute, “A Passion for Primes”. Individual tickets are $25-$55 and All-Festival Passes (including priority seating tickets to all festival activities) start at $60. Tickets are available through the Box Office at 415-992-6677 or online at http://playground-sf.org/bestof. This year’s Best of PlayGround ensemble includes: Rinabeth Apostol, Stacy Ross, Adam Roy, Teddy Spencer, Howard Swain, and Jomar Tagatac. Best of PlayGround finalists include: Rachel Bublitz for Mom's Ham and Steven Westdahl for If All the World's a Stage, Where's the Audition. How far apart can a pair be and still be together? Inspired by the true-life story of mathematician Yitang Zhang and his proof of the twin primes conjecture. A student/teacher conference takes a turn that neither student nor teacher quite expects. A mother-daughter school interview deteriorates quickly as secrets are revealed. In Washington D.C., no issue is too small to provoke partisan bickering. A New York City transplant realizes she has entered uncharted—and somewhat disturbing—territory when she starts looking for love in San Francisco. Finally, the zero gravity musical of cross-cultural love, moon dust, and faulty plumbing that the world has been clamoring for! Inspired by and featuring the Gershwins’ Love Walked In. William Bivins (The Broken-Tooth Comb) is an award-winning playwright whose full-length productions include The Education of a Rake, The Apotheosis of Pig Husbandry, The Position, and Pulp Scripture, among others. He has won the Bay Area Theatre Critics Circle Award, the Hyperion Project Original Play Competition, and numerous SF Fringe Awards. Patricia Cotter (When You Talk About This) is a freelance writer and writing teacher. She has an Emmy Award for her comedy writing, the Richard Rodgers Award for her musical Rocket Science and is twice winner of the Los Angeles Drama Critics Circle Award for her musical, The Break Up Notebook. Patricia is a Groundling Theatre alum. Victoria Chong Der (Riding Dragons) has a BA in Creative Writing from Oberlin College. Her work has been produced nationally. She is currently working on a short piece for All Terrain Theater and a one act for the SF Olympians Festival. She is also a member of the NewWorks Incubator Program at the Asian American Theater Company. Ruben Grijalva (Mr. Wong’s Goes to Washington) earned his BA in Cinema from SFSU and helped start the fitness-entertainment company Virtual Active. Works include the award-winning short film Shadow Ball (2007), the full-length play Foresight (2010), and the short play Value Over Replacement, which featured in the Best of Playground 2013. Karen Macklin’s (Stranger in a Stranger Land) plays have had readings or productions at Actors Theatre SF, Eureka Theatre, SF Playhouse, and PlayGround. She has an MFA in Creative Writing from SF State, and has been a BAPF finalist. She is also a widely published journalist, and a local yoga teacher. Visit www.karenmacklin.com. Maury Zeff (Love Spacewalked In) has an MFA from the University of San Francisco and was an SF Writers’ Grotto Fellow. His plays have won a PlayGround People’s Choice Award and been semifinalists for the Vittum Prize and in the Indie Boots Festival. His fiction has appeared in American Fiction 2012, Southern California Review, and Switchback. 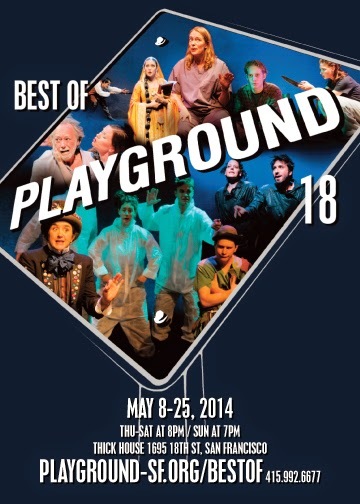 WHAT: Best of PlayGround 18, featuring the best short plays/musical by the Bay Area’s best new writers. Includes works by William Bivins, Patricia Cotter, Victoria Chong Der, Ruben Grijalva, Karen Macklin and Maury Zeff. WHEN: May 8-25, 2014; Thu-Sat at 8pm / Sun at 7pm. TICKETS: $25-$55. Pay-What-You-Can Thursdays at the door beginning one hour before the performance, subject to availability. All-Festival Passes start at just $60. For more information about the Best of PlayGround, call (415) 992-6677 or visit www.PlayGround-sf.org/bestof.